According to the Los Angeles Times, California’s newly proposed $15/hour minimum wage by 2022 could spur more local apparel manufacturers to exit the state if not leaving the country. For example, the American Apparel, the biggest clothing maker in Los Angeles, has announced it might wipe out about 500 local jobs and outsource the making of some garments to another manufacturer in the United States. Statistics from the Bureau of Labor Statistics (BLS) show that the number of employment in the L.A. apparel manufacturing sector (NAICS315) decreased by around 32% from 61.8 thousand in 2005 to 42.0 thousand in 2015. Meanwhile, average hourly wage for sewing operators in California increased by around 25.5% from $8.98/hour to $11.27/hour. 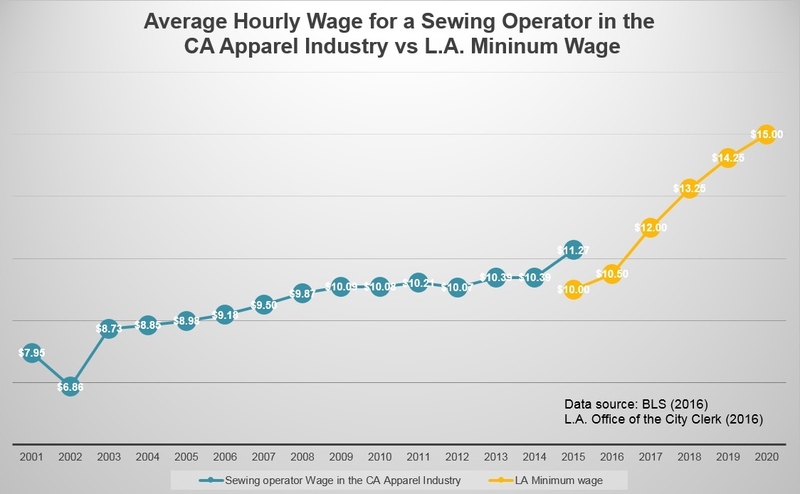 As another source, the California Fashion Association says that the hourly wage for LA apparel workers was around $15/hour in 2014 (all occupations). As reported by the Los Angeles Times, many apparel companies see L.A. increasingly become a difficult place to do business because of the expensive and limited commercial real estate, the rising pressures of raw material cost and the difficulty of finding sufficient skilled workers who can afford to live in the city. Companies expect the situation to get even worse after the minimum-wage hike further raises their operation expenses in the years to come. Some industry professionals suggest L.A. may “become for apparel what Silicon Valley is for technology: the hub for the design, but not the manufacturing, of products”. 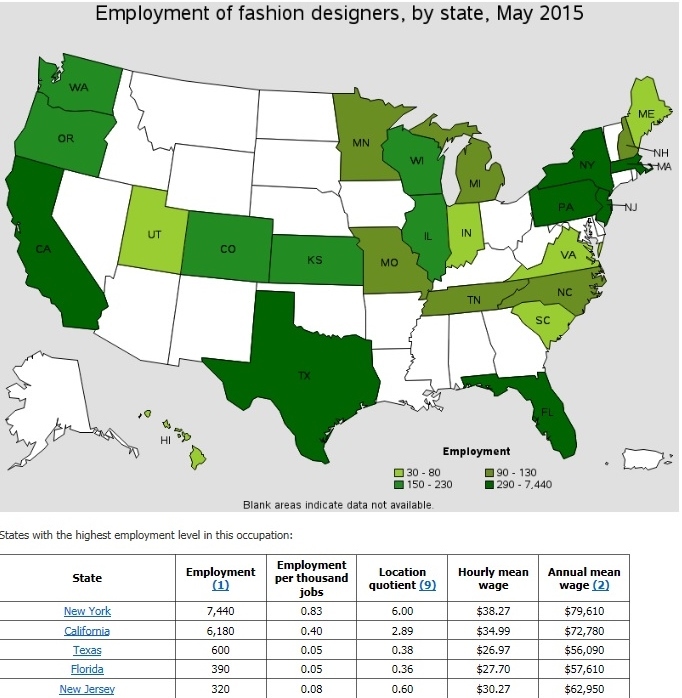 Data from the California Fashion Association shows that in May 2012, 3,770 independent fashion designers worked in Los Angeles, earning about $30 an hour in Orange County and $35 an hour in the L.A. County metro area. However, such a prospect is unclear given the advancement of technologies such as the CAD system which makes location less critical for fashion designers. On the other hand, L.A. is facing competitions from other apparel hubs such as the New York City for design businesses and talents. Since the wage is increasing for Californian sewing operators, employment is decreasing. Does this mean the workers are doing more work individually to make up for the loss of workers? Are they working longer hours? Does the wage increase balance out with the loss of workers? If it is very expensive to live in California, wouldn’t raising the minimum wage increase the price of everything else, making it all over more expensive? If they source those 500 local jobs somewhere else, how much will they be saving? There will be transportation and storage costs that might not even out to the expenses saved on those categories if production were in LA with the higher wages. We talked in class about how companies are trying to bring jobs back to the US instead of outsourcing to foreign countries, but if we can’t find the properly educated workers in the top fashion cities in the US, where will we find them? LA designers want to source those 500 jobs elsewhere because they do not feel there are skilled enough workers locally to manufacture their products, but where do they plan on going to get those workers? While the minimum wage in California increases, the desire for manufacturers to relocate to other states does as well. Even with the increase in wages, employees find it hard to live in LA due to the outrageously expensive real estate and cost of living. Manufacturers face pressures too such as limited real estate, the rising costs of raw materials and the difficulty of finding enough employees who can afford to live in LA. The addition of the new minimum wage will push manufacturers over the edge. Personally, I believe LA will lose some of its workers and manufacturers to New York, and other popular destinations known for its fashion hub while still maintaining offices in LA for show. Very true. However, I feel like in a developed country like America our government would (hopefully) never allow something that catastrophic to happen due to a manufacturer’s inability to pay higher wages. There is definitely a similarity between the LA case and what is happening in Bangladesh. However, I do think that the situations are quite different in that LA/ the US already has an established economy and society. I think in someways, it is more difficult for Bangladesh to start giving their workers more money when their government is experiencing instability. Sometimes it is more difficult for the US to increase wages because so many people are affected by it as well. On both accounts, it shows how raising wages affects so many different aspects and is not a quick and easy decision to make. I think that the wage increase will affect the US textile industry in a drastic way. The US has become an increasingly less desirable place to source with because of high operating expenses. Countries including China have been been able to beat out the US as more cost effective in terms of getting textile resources. This decrease in employment is attributed to the rise in technology. The textile industry throughout the years has become less labor intensive and more capital intensive. With that being said technology has allowed for an increase in productivity for exports. It is important to note whether this increase in wage levels will cause a decrease in exports for the US? Raising the minimum wage has been a contentious issue throughout the US in recent years. But, I did not realize how important this was to the LA/California area- particularly to the apparel industry. LA is already plagued with problems for the industry, including high rent and the lack of skilled labor. I see both sides of the argument for raising wages. First, I think raising the minimum wages may motivate more workers to join the industry as well have more money to live on. But, I also see the business side of things. Raising the minimum wage also raises costs for the company and forces them to lower their margins. I can imagine it is tempting for companies to research the option of relocating somewhere that labor and manufacturing is cheaper. I think the debate for raising the minimum wage will continue on and I am eager to see what happens. I think that this article has many interesting points that relate back to our class discussions. While reading it, the first thing that popped into my head is it relates back to the flying geese model. No matter where you look in the world, apparel production is an ever evolving industry and different areas of the world are always evolving at different speeds and are at different levels of advancement. Right now, in the US, workers are understanding that the US textile industry is advanced and capital intensive. They know that their work is worth more and are demanded to be compensated. This relates back to the flying geese model in Asia, the industry shifts when things get too expensive and advanced. I think that raising the minimum wage in the US is a much bigger issue that affects the entire country, not just those involved in the textile and apparel industry. It is one of the many large issues being discussed in this years presidential race. It will be interesting to see if certain candidates, such as Bernie Sanders, were to actually raise the minimum wage. Would it have the same effect if the country all together raised the minimum wage? Would the entire country have difficulty continuing textile production? As we discussed in class, apparel manufacturing is important to our country as we try to bring back the “made in america” name. California in specific, plays a huge role in this apparel and fabric manufacturing. However, as mentioned in the article above, the increases in the wages make it harder for Untied States to keep this section of the apparel industry in California. Apparel industries are having to cut costs more than ever and one of the way they are doing so is by outsourcing apparel production. This way they can still give the consumer what the product they want at the price the want, while still maintaining profits. As time goes on, I can see the competition becoming harsher which will force brands to create lower prices, resulting in more outsourcing and less American jobs. The only upside that comes with wages being raised is the fact that companies may be able to acquire talent that they would not have had before, however, I do see an issue within work place experience as fashion companies are expecting quicker turnaround with products that are lower in cost, resulting in a potential unfavorable work experience that might lead the apparel workers to pass on the opportunity. With the increasing minimum wage many apparel companies see Los Angeles becoming a more difficult place to do business. They see it as becoming a design hub instead of manufacturing as it had been in the past. What will this do to the manufacturing of made in the USA products? Will apparel jobs leave New York for Los Angeles where the commercial real estate is less expensive and limited even with he increase in minimum wage? Does this situation in Los Angeles set a stage for all manufacturing leaving the United States all together? What will this do for our economy as a whole? I find it very interesting how companies are finding LA a bad place to product their products. It is shown that the wage level is increasing as the employment level is decreasing. This makes me wonder, is it really worth it to increase the minimum wage rate if there will be less employed people? In order to keep up with LA’s competition, which includes the U.S., I feel that it is important to lower the minimum wage rate slightly, so that apparel companies will be able to higher more workers and increase the employment rate. Since LA is known as one of the fashion capitals in the United States, if companies are saying it is more of a design hub rather than a manufacturing hub, what will happen to the LA apparel market? Will this mean that rather than turning to another manufacturing location in the United States, LA companies will turn to manufacturers outside of the U.S.? 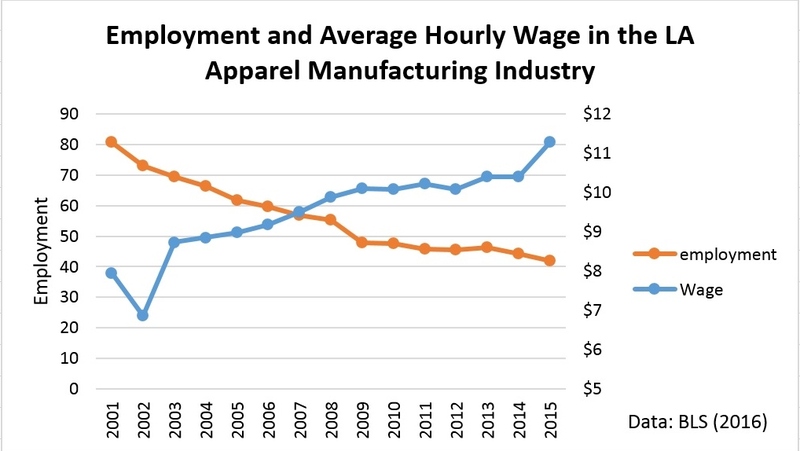 This will decrease the amount of “Made in America” products, which I don’t feel many U.S. citizens will be very happy about..
As you can see in the first graph “Employment and Average Hourly Wage in the LA Apparel Manufacturing Industry”, employment has been declining while wage has been almost simultaneously increasing. This in itself goes to show how with the rise of wages, manufacturers are either laying off employees or completing exiting the state—either way, it shows people are losing their jobs. Therefore, it is believable that if California increases minimum wage to $15/hour by 2022, more local apparel manufacturers will move such practices elsewhere. However, I believe it makes sense for California to raise the minimum wage as the cost of living there is expensive, among other factors. But what regions specifically will such manufacturers look towards moving to? Will some choose to move out of the United States or will they stay domestic but to other states where the minimum wage is lower? How will this affect the LA apparel industry especially compared to New York City—one of their biggest competitions in the U.S.? Another interesting thought I had after reading this is in regards to New York City. New York City’s cost of living has also become increasingly more expensive and has seen an increase of difficulty in finding workers who can afford to live there so will they propose to raise minimum wage as well? Why or why not? great comments and questions. I am sure the proposed minimum wage will affect NYC as well. sometimes we call it “disruptive creation”–those low-paid, low-end jobs/industry won’t be able to survive when the wage level reaches a certain level. These old jobs will be replaced by higher-paid jobs in more advanced industries. As an aggregate effect, the economy is upgrading. In practice, adjustment cost is often a problem–those people who do not have much education and skills are most vulnerable in the job market and likely to lose jobs. They are also hard to find new jobs when affordable training program/opportunity is available. Raising the minimum wage, in retrospect, is a good idea to provide a better life for those workers and a better state of living. However, raising the minimum wage also means that businesses might raise the cost of the product in order to offset the increase in wages. This means that consumers must be willing to pay more for a product, which most of Americans are not willing to do. Increasing the minimum wage could also lead to the business hiring less, which would increase unemployment. Indicated above, when LA increased their minimum wage their employment decreased by 32% in 2005! In the end, it is an agreement of whether to spread out the wages at a lower price to more people, or increase the wages at a higher price to less people. Smaller factories or business might not have the means to pay their workers anything above the minimum wage yet. On the other hand, increasing the minimum wage would give those garment workers more money to spend on disposable income. This is only possible if other businesses don’t start rising their prices because they know the minimum wage is now increased. The minimum wage also hasn’t accounted for inflation in the past couple years. I agree with the statement that LA will become the hub for design, but not for manufacturing. Manufacturing is always sourced from where you can get the cheapest product with most companies. Increasing the minimum wage would discourage companies even more from sourcing from the US, and the “made in America” dream would crumble unless businesses change their idea of making the most profits which is a fallacy since that is the core of business. I find these statistics to be very interesting because even $15/hour in the LA area is not very much money. Last summer I visited LA for a week and noticed that the prices of everything from food to tourist attractions to clothing was very expensive, and similarly priced to NYC. These statistics left me wondering, why manufacture in LA when workers have to pay a much higher rent, more for food, and more for all basic necessities. Maybe it would be smarter to move manufacturing to a more rural part of California, where low paid workers can afford the cost of living, and keep other parts of the business in LA, where workers that are making higher wages can afford the cost of living there. Raising the minimum wage is a hard topic because in the world today everything is getting more expensive, so workers are taking home less disposable income, and are being forced to spend a larger percentage of their money on necessities such as food. This is a sad reality that we are facing. great reflection and thinking! indeed, this is not an easy issue to solve…nevertheless, I hope after taking FASH455, students can realize the connection of our sector with these real and important debates in the society. This is our impact! I think that raising the minimum wage to $15 in California would be very beneficial to workers at jobs making minimum wage- all of my jobs while in high school were at NY’s minimum wage of $7.25 so $15 is definitely a significant difference in my opinion. I think this would hurt the industry as a whole in the United States as there would have to be some severe job cuts in to make up for the the increased pay. This doesn’t help the US industries domestically and the “made in America” trend that so many American consumers want. I am curious how increasing the minimum wage will affect the state. I am curious to see if more people will try to work in California for this reason, and what their hours will look like. After reading this article, I was wondering if part of the issue came from an extremely high population in a specific area, and if businesses did choose to relocate if this could help the situation? Rent in LA is high, and skilled workers are low… if businesses looking for skilled workers relocated to less populated areas and paid a higher minimum wage, would they be more successful in their business? Although the increase in minimum wage is supposed to be beneficial to workers, could it really be hurting them? By raising minimum wage, there is less of a budget to pay employees. This is seen in the decline of employment in LA right after the pay increase. I believe it is hurting the workers. Raising minimum wage has always been a very controversial topic, but I believe it it is important to discuss. Increasing minimum wage means the money is being taken from elsewhere. I think this is why we see the unemployment rate increasing. As shown in the graph above, it is clear that with California highering their minimum wage, their economy will take a drastic turn. Apparel companies forced to pay their employees a higher wage will lead to many positions being lost and people being laid off. Companies will have to make budget cuts in other areas which could also lead to poorer treatment/lower wages for workers in factories abroad. It is already difficult to produce and manufacture clothing in the U.S. due to heightened prices, and I think the U.S. textile industry would lose more business with this wage increase. This was a very interesting article to read, an very relevant as well. Minimum wage, weather to raise or lower it, is always in the news. As seen on the graph, the equilibrium wage would be about 9.75. However, with the projected wage in a few years being 15 will lead to many problems. First, I think it will lead to some unemployment because companies will no longer be able to have as many employees as they did before. This makes me wonder if they will start to hire work illegally and pay people willing to work for less. Also, as many other people has stated, it is already hard to produce and manufacture in the US and this may make it even harder. However, I do see both sides of the argument because workers want to be able to make a sustainable living. I will be interested to see what happens in the future. When asked, most people say they favor fair wages. As a summer worker, i personally would happy with increases in minimum wage. However, if you think more in depth, with higher wages comes higher clothing prices. The textile and apparel industry is really at a stalemate with who they want to please. I personally think that California is doing the right thing and setting a precedent for other states by claiming they want to increase there minimum wage to $15/hour by 2022. There is this great stigma that textile and apparel makers work in dangerous factories and get paid ridiculosuly low wages. While this may be true in some cases, increasing wages is a huge step in getting rid of this stigma. Unfortunately, California’s claim of increasing minimum wage is influencing companies that manufacture in California, to produce else where. This blog really shows how complicated the textile and apparel industry is and how controversial many policies that get proposed are. I think raising the minimum wage sounds good on paper and for the employees who originally make around $8 an hour, however there are many factors to consider in this matter. Raising the minimum wage will greatly affect the U.S apparel industry, and maybe not in the most positive way. There are many downsides to raising the wage to $15. First, if American Apparel is starting to wipe out jobs and outsource to other manufacturers in the US, other costs will arise as well, making the product more expensive. You have to take into consideration storage, handling, and distribution costs as well. In general, by raising the wage, many companies will have to lay off many of their jobs in order to pay their employees as well as cover all costs of production. This will also cause a price increase in the products because employers have to generate enough income to support production and employee costs. With increased layoffs, there will also be fewer job hirings thus adding to the unemployment rate. Lastly, this will also lead to increased competition. So although raising the minimum wage to $15 sounds like a good idea, in turn, it could do great damage for the apparel industry. Raising the minimum wage is an admirable proposal, however, raising it to $15 is not suitable for the apparel industry because costs of real estate are already so high, that it may cripple smaller apparel manufacturers. I believe that it should be raised to a more moderate $10. Unless there is a large push for goods made in the U.S I do not believe the $15 minimum is a reality for LA apparel workers. If demand booms like it did for tech however, it will be, but i do not think that is likely because of sourcing trends which favor the cheapest labor. Owing to the fact that the increasing minimum wage is increasing in LA to $15 an hour, there will be much higher cost for production. I think this higher dollar amount will help workers in the production factories to be able to afford the means to live in California. That being a beneficial aspect to raised minimum wage, other businesses will find it extremely difficult to do business with LA based manufacturing factories due to the increase in production cost. This is driving companies out of the state of California. I recently visited California this past April and took into consideration how expensive everything is out there. This helps me to connect how important this minimum wage is for the workers. I think it is only fair for them to receive a higher wage considering how much it costs to live, eat, and commute. This is a difficult crossroad for manufacturing companies to put into affect. The vast majority of apparel and retail companies these days are on the hunt for the cheapest procession, which comes along with cheap labor. I think this causes those apparel and retail companies to search elsewhere for their labor sourcing. I think they will search outside of California, or possibly out of the US… which raises an even larger concern that these higher wages are effecting the entire US textile and apparel industry. I think due to the fact that Los Angeles has been losing many businesses and they happen to be moving to different cities including NYC it was unwise to raise wages so recent. L.A. already has very competitive commercial real estate and insufficient work force. By adding an increase of minimum of wage of 15$ will drain L.A. of more business. I know they believed that if the wage increase happened people good workers would be able to afford closer housing in the city but even at 15$ an hour it is still not sufficient enough to live in L.A. I see a lot of similarities with the increase of wages in countries liek China. By having wages that are drastically higher than other places in the country it is very easy for the business to move to a different region. If there was a country wide change of wage I think it would not cause more businesses to go over seas. I think there would still be a good amount of businesses in the US with better wages. How are these wages decided and changed? Are they done city wide, or by union or both? Would it possible to pass state wide or even country wide bills pertaining to the minimum wage of the American workers? LA may “become for apparel what Silicon Valley is for technology: the hub for the design, but not the manufacturing, of products”. This is a truly remarkable quote. Since it’s so expensive in LA and there is limited real estate, I would have to agree with it. There are so many great designers located in LA, but there just isn’t enough space and it’s too pricy. Also, I don’t view the employment going down and the wages going up as a good thing. The people who are still employed are lucky because their wage has increased. Meanwhile more people have lost their jobs, about 34% of the people. I think it would of been better for more people to have jobs, with lower wages. Companies are finding LA to be not so great of a place to produce their products. Raising the minimum wage to $15 is not something that the apparel industry can deal with. $15 for apparel workers in LA is not reasonable because that is too much money. By adding an increase of minimum of wage of $15 will only diminish the LA businesses. Because of sorting trends and the fast fashion that our society loves, we need to look for the cheapest labor. Therefore, the cheapest labor will be overseas instead of in LA. It is interesting to hear that LA, California may become the hub for fashion design as silicon valley is the hub of technology. I never knew they were on such a rising path before reading this. Shouldn’t it be okay that LA is a great design hub and not so much a manufacturing hub? Can’t another state take over that responsibility and have lower minimum wages than 15$ an hour. This high minimum wage pay in LA will increase designers to work harder and transport there instead of other states. LA could spark new designers and I don’t think anything is wrong with it becoming a design hub instead of a manufacturing hub. Since taking this class and reading this article specifically, I’ve been discussing the topic of living wage with a friend who is on track to becoming a lawyer fighting human trafficking, unethical labor, etc. We’ve never really reached a consensus of what is considered a valid fair wage, because while it’s ethical to pay wages fairly, it’s also very hard to run a business with high labor costs. It’s a really difficult issue, of figuring out the extent to which labor can be “cheap” but also fair for people to make a genuine living. I wonder if it has to do with consumer demand; If consumers were willing to pay for a more expensive product that would offset the cost of labor, the higher minimum wage would be valid. It seems likely to me that L.A. could become like a Silicon Valley for apparel – dominating design and not production, although I don’t think it surpass New York. This is similar to the way New York City is a fashion hub and major center of design, but the production in the Garment District and other parts of the city have really decreased. It is unfortunate that a company like American Apparel is unable to pay many workers $15 an hour. But it can be assumed that the company was and still is regaining its footing after its bankruptcy last year.